Social media in the classroom might be a good idea. No, seriously. If you were to ask teachers in Singapore how they felt about social media in the classroom, most will reply that it has been an annoying distraction that they have to grapple with during their lessons. Unfortunately for them, the truth is social media isn't going anywhere. From kids in primary school to graduates in university, social media is where they communicate, collaborate, and create. This chaos of activity is happening independently. At schools, Facebook groups are usually created to facilitate internal communication with classmates and co-curricular groups, most of the time without the supervision of a teacher or tutor. The question is, are there legitimate ways to transform social media into a teaching and learning tool? 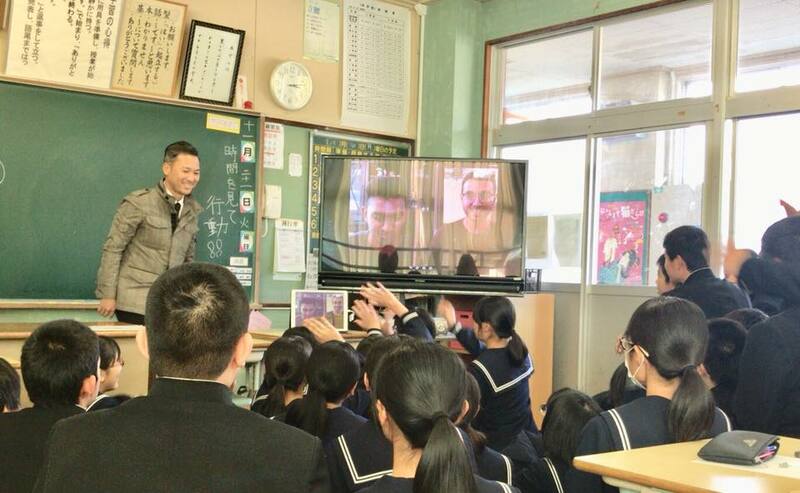 Recently, Neighborhood was thrilled to be invited by Mr Michihiro Kawano of Nichinan City as a guest speaker during one of his Facebook video sessions at Togo Junior High School. The virtual cultural exchange's main goal was to help Japanese students develop confidence in using the English language to converse. As we answered the video call, a tsunami of waving hands and chattering buzz hit us. We were pleasantly surprised to see the entire class huddled together on the floor to greet us, as if they wanted to grab a front row seat to a movie they've been anticipating. You would be hard-pressed to find a more thoroughly engaged group of 16-year-olds during a lesson! After a short introduction about our fields of interest in art and food, we took questions from the floor. Each student approached the camera, and posed questions that covered a breadth of subjects including food, travel, anime, and sports. For 15 minutes, Facebook allowed us to share and bring learning to life in a classroom in Japan. For students like Erika Hamadha, it was an opportunity to connect and speak with someone four thousand kilometres away without leaving the confines of her classroom. In Singapore, social media has been widely used at Ngee Ann Secondary School since 2009. Teachers use Facebook in their classes to send web links to pupils. Students use Twitter during English lessons to summarise literary passages. In home economics and art classes, teachers and students use picture-sharing and infographics sites, so everyone can see the same images. Teachers said that students’ grades for project work have improved since the experiment began and they acknowledge that they too are learning all the time from their pupils. Ngee Ann Secondary School is one of eight "FutureSchools" in Singapore that aims to constantly innovate and push the frontiers in using technology to enhance learning. It is our hope that more schools, regardless of their elite branding or "neighbourhood" status, begin to see this free and valuable resource as a way to break down the walls of the classroom and reignite the curiosity needed to shape Singapore's young changemakers. A two-day workshop for 26 students that enhanced self-awareness and the hands-on benefits of art therapy. People's Studio is a creative residency programme that invited emerging artists and designers to spend one month at a makeshift pop-up space in the heart of Yishun in Singapore. Notes on community, art, and design.